To be totally honest with you, I’ve never planned to visit The Seychelles islands. They weren’t on my “paradise bucket list”, such as The Philippines and Bahamas. Now you’re probably thinking, what? Sonja, you just told, you always wanted to hang out on beautiful beaches on the earth. I know, but let’s say, I’ve kept saying, the Seychelles are a pricey and boring honeymoon destination (sorry..). 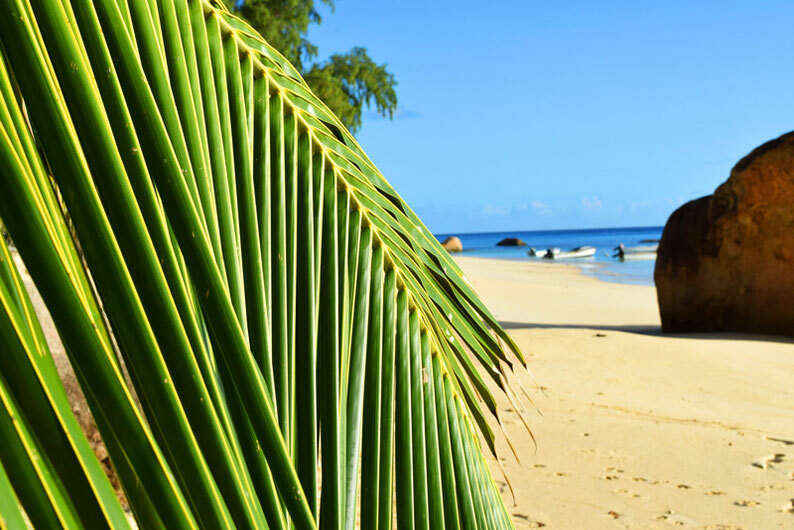 Nevermind, while I was looking for cheap flight tickets to South Africa or Namibia, I stumbled upon this special-offer fare of 530 EUR for a multiple flight trip to India, Seychelles islands and South Africa, operated by Etihad Airways. This was very tempting to me! However, a 3-week journey to these 3 countries was a bit too much in my opinion. I decided to search for a cheap ticket only to Seychelles and South Africa. And LOOK, the offer was there and for the same price! 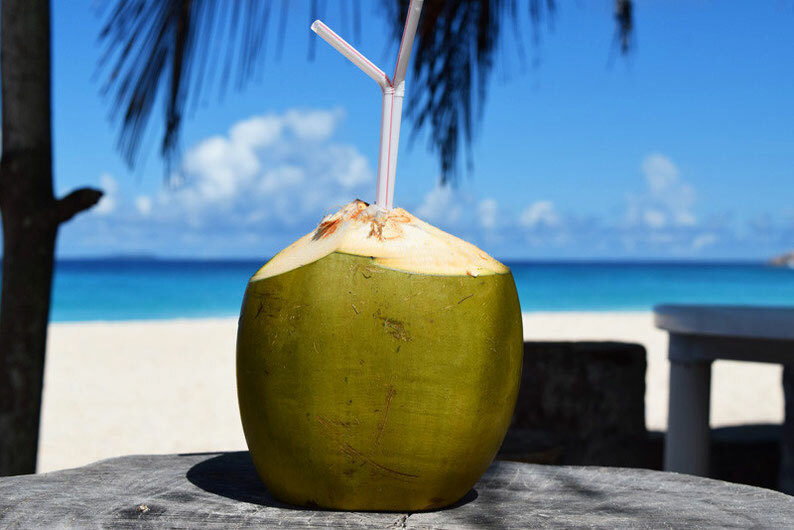 After a while, I clicked on “Buy” and a couple of months later, we were sipping coconut water on breathtaking beaches! After our 6-hour stopover in Abu Dhabi (I’m going to talk about it in my next blog post), we took our overnight flight to Mahe, the biggest island of the Seychelles’ archipelago, with approx. 80,000 of inhabitans. 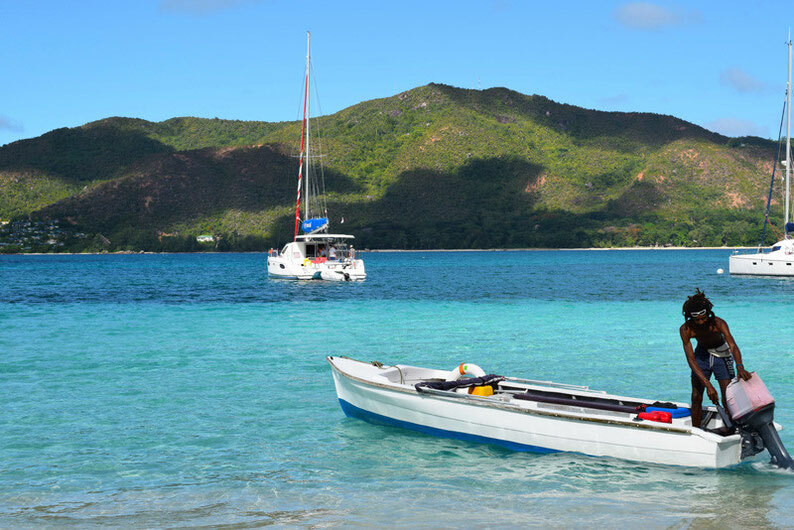 After landing in Victoria, the capital city of the Seychelles islands, we were waiting for the Cat Coco shuttle bus to give us a lift to the port, from where our journey to the Praslin island would continue. We were so sleepy on the boat ride, trying to stay awake, but it was nearly impossible. Our heads were just falling in each directions and probably for the neighbours, we were a funny couple to watch. 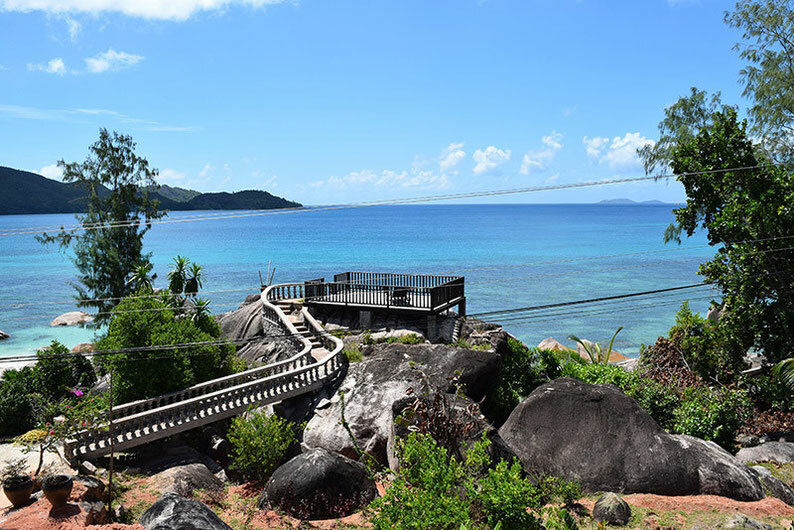 The drive itself is actually really bumpy but us being in our own worlds, prevented us from having any stomach issues 🙂 Finally, we arrived to the main port of the most-known Seychelles island – Praslin. Taking a taxi to our property was the only thing we were able to conquer in our situation. It was a 20-minutes drive to our accommodation. The first impression of the stay was WOW! We actually realised, it is a villa! There were 2 apartments, the upper one with a balcony was ours. The property had even a special terrace for its guests to enjoy the views of the sea. I can guarantee you, it was one of the best stays so far! We were offered fresh fruits every morning: bananas, coconuts, mangos, limes, maracuyas.. and all fresh from the garden of our host! Due to our tiredness from the long-haul flights, we spent the day relaxing at the villa and having fun at the nearest beach (2 minutes!). Planning the activities for the next days was also a part of our day 1. 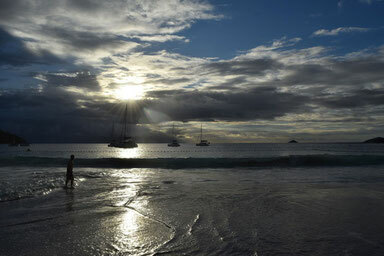 All days in the Seychelles islands begun were early. At 6 am we were awaken and ready for our next adventure – visiting the neighbour island, called the Curieuse Island. Before we left the small Seychelles island to go back to Praslin, we had some joy in the waters. 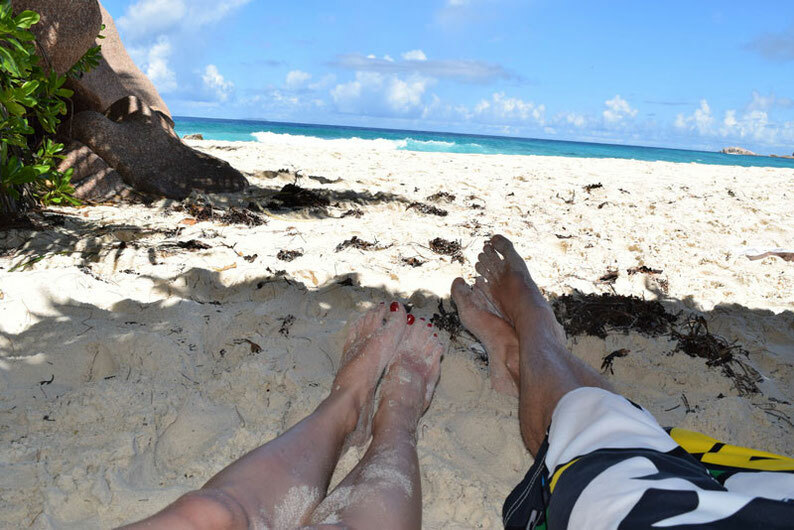 We couldn’t say no to this nice beach and the turquoise water! 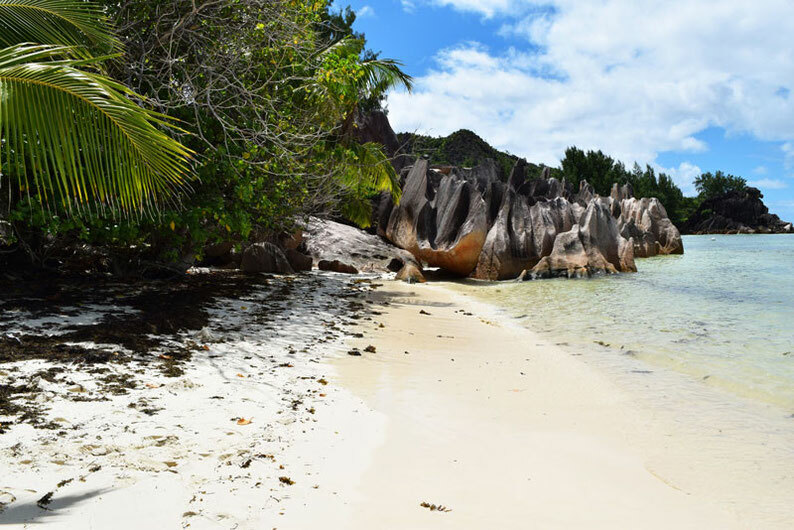 The next day was reserved for a day-trip to the third smallest Seychelles island and with its one of the most beautiful beaches on earth, Anse Source d’Argent. This island is called La Digue. 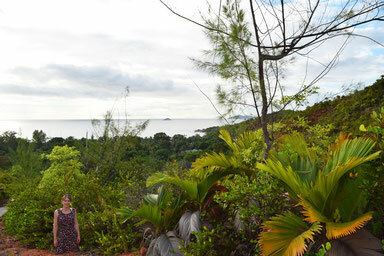 The first three days were almost over, when we decided to go for a beautiful view of the Seychelles islands. Actually, the original plan was to bring back the bikes and to ascend to this beautiful place. However, Jerry was stubborn (pfff!) and wanted to see if it’s possible to do the path by bikes! (don’t do it!). So, with an angry face I decided to go for it. And it was…horrible! 🙂 Imagine, 35 degrees C, very humid and a very very steep path! We couldn’t even ride our bikes. I got a bit loud and pissed off, but Jerry helped me with taking my bike too and walking both to the top. After several emotional breakdowns (haha), we conquered the path and arrived to this WOW place. 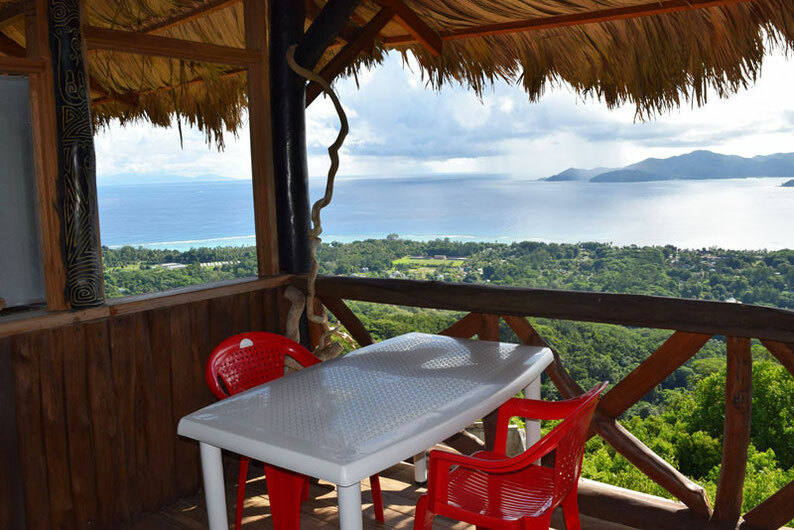 Amazing views, fresh fruit drinks. 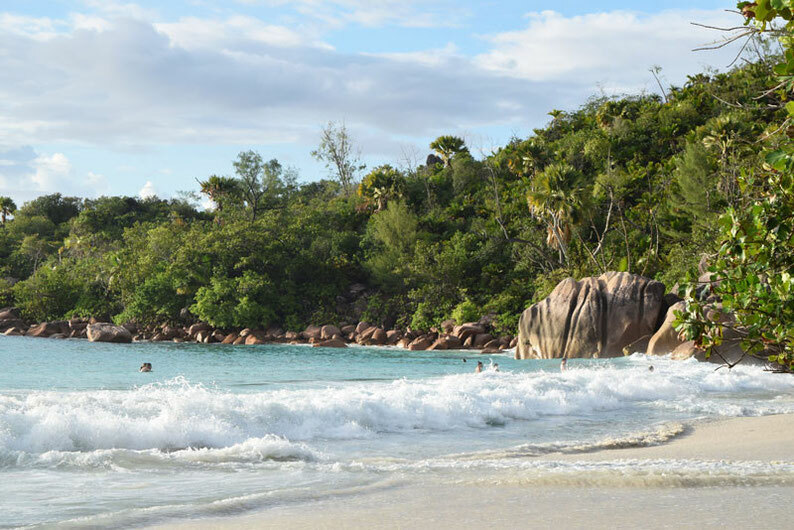 Seeing all this neighbour islands was something unforgettable but we also wanted to explore what’s the deal with Praslin, the world-famous Seychelles island. So far, we’ve seen just the near beaches and our property area. 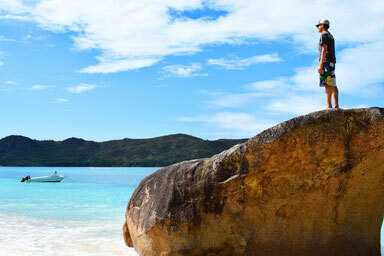 We know, there is this one beach on Praslin, which shouldn’t slip out of our itinerary – Anse Lazio! Taking the 30-minute walk to this beach was easy, although it went a bit up and down. Definitely worth doing it! Seeing this beach was so cool – it had a relaxed atmosphere with only a few people. We took a swim in the Indian ocean and played with this huge waves! An awesome ending of a day! Oh except of the massive tropical rain shower on our way back. Luckily, after a while, we got a car lift by some friendly tourists.. The last two days we spent on Mahe. It took us an hour by boat from Praslin. Our plan was to see as much as possible and this was only doable by renting a car. So we did! Our day started with the capital of Mahe, Victoria! 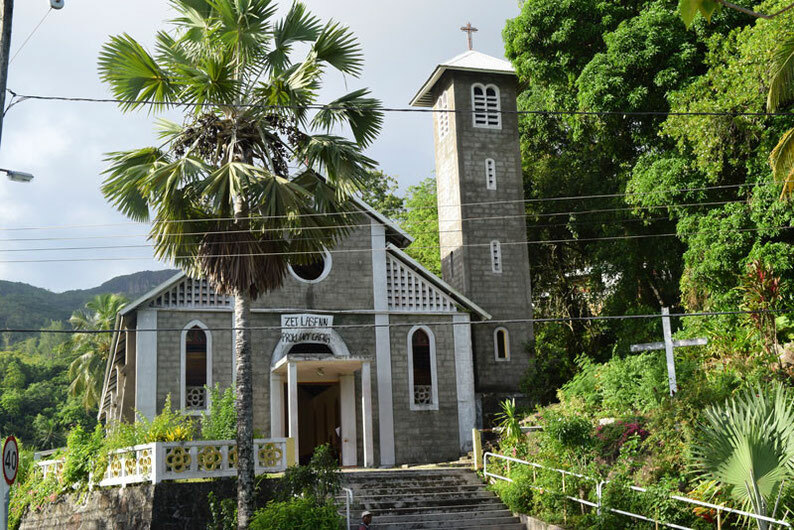 It’s a nice British colonial city with a market worth visiting, some amazing churches and a botanical garden. 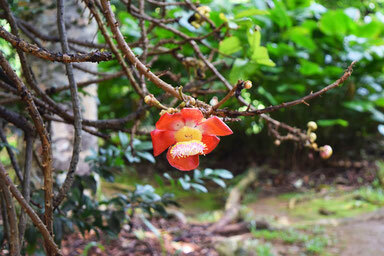 After sipping some coffee and a pineapple-passion fruit juice in the city center, we went on a walk through the many plants The Seychelles islands have to offer. 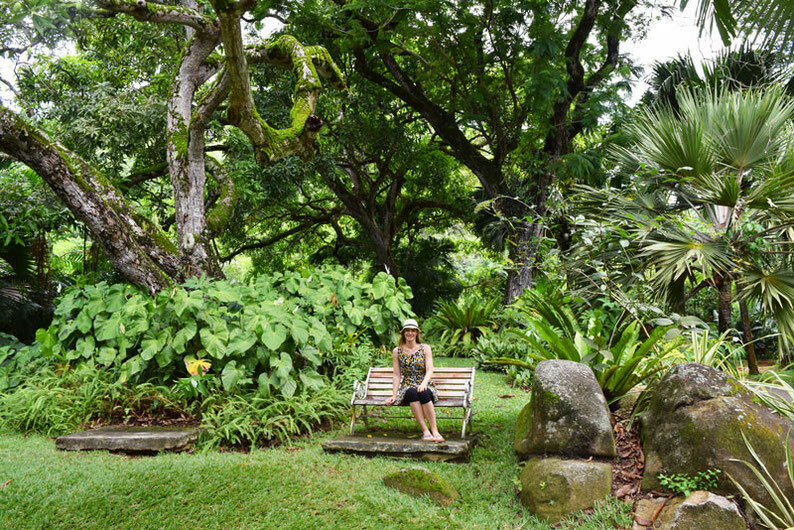 It’s a nice green garden with even some tortoises. Beau Vallon was our next goal to reach. 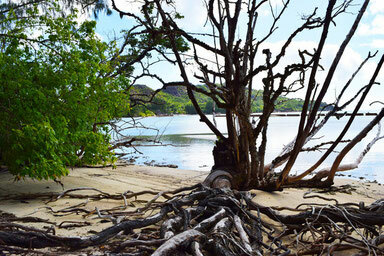 It is one of the best beaches to explore on Mahe. 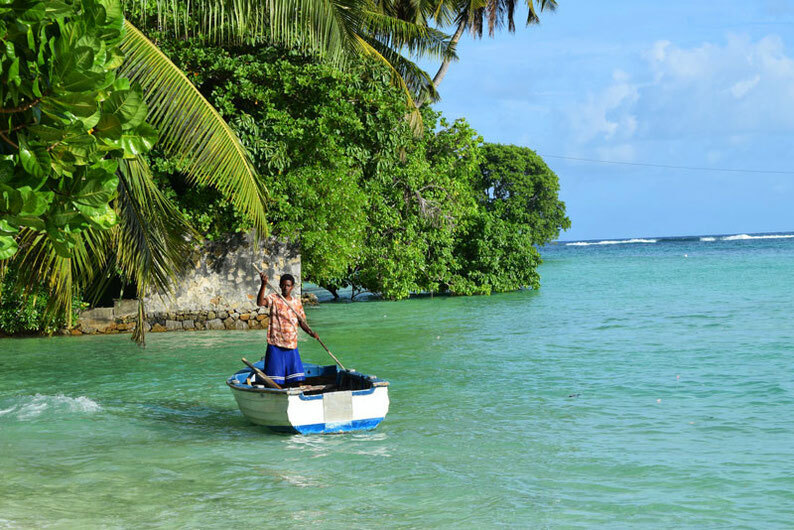 Situated on the northern coast of the island, it is very popular among tourists. The beaches are nice but in my opinion, it can’t compete with the ones on Praslin and La Digue. We spent 2 hours there, putting our feet into water and taking a nap. 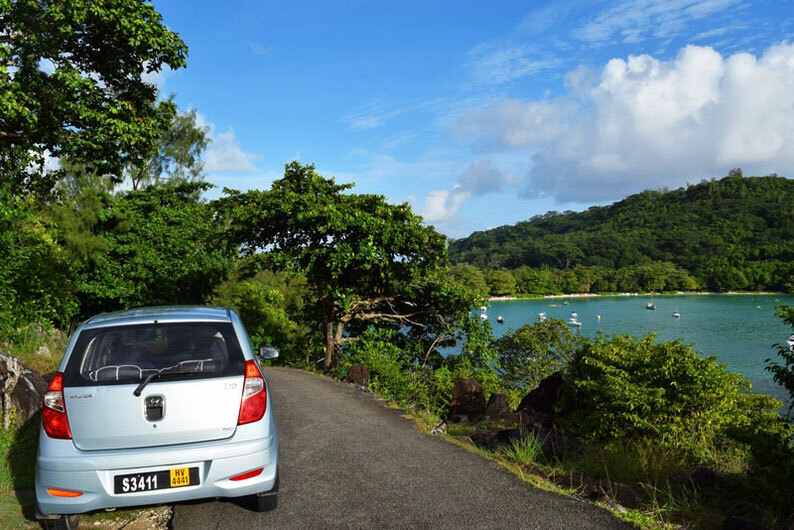 The road trip from Beau Vallon to the western coast continued through the world famous Morne Seychelles National Park. It was a scenic drive with some stunning views and with a visit to the tea factory! 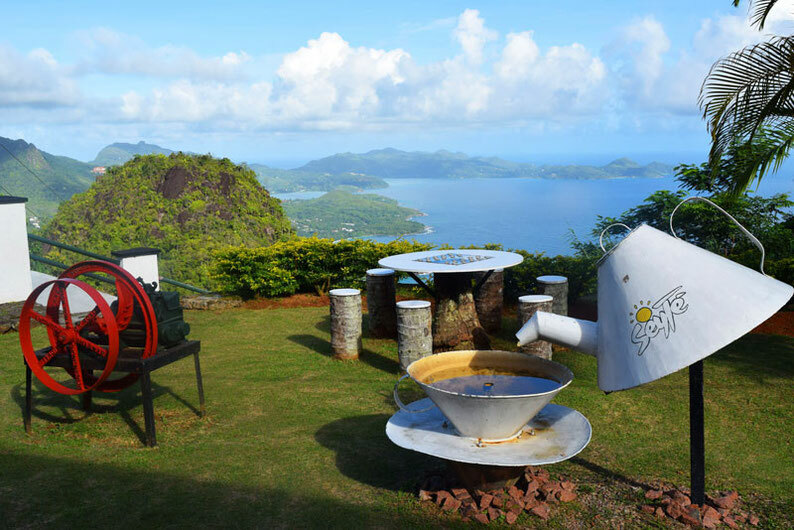 At the factory they offer tours, which we wanted to attend, but hey we missed the opening hours.. well, there was this wonderful view of the hilly landscape of the Seychelles islands, which we won’t forget. Driving the west coast of Mahe offered so many nice views of the coastline. The views just screamed: Take a picture of me! We got the impression that this part of the island is not that popular among tourists. We actually don’t know why, as it’s so picturesque! 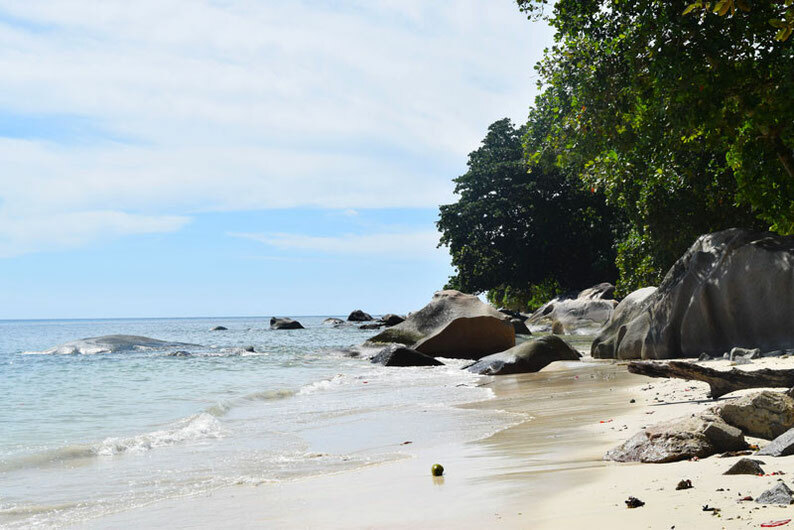 If we had more days to explore the Seychelles islands, we would probably spend it here swimming, sunbathing, eating out in restaurants and visiting the waterfalls. Look at that beautiful church below! There were so many nice buildings along the western coast of Mahe. After taking million of photos of this part of the island, we knew, our vacation in the Seychelles islands is literally over and it’s time to drive back to our accommodation, having one more night on the island and next day catching the early morning flight to Johannesburg, South Africa. And, do we still think, the Seychelles islands are a pricey, boring honeymoon destination, as we thought it would be? Well, the prices are high (I’ll write about saving options too), but you’re definitely not going to be bored and it’s not only for honeymooners! 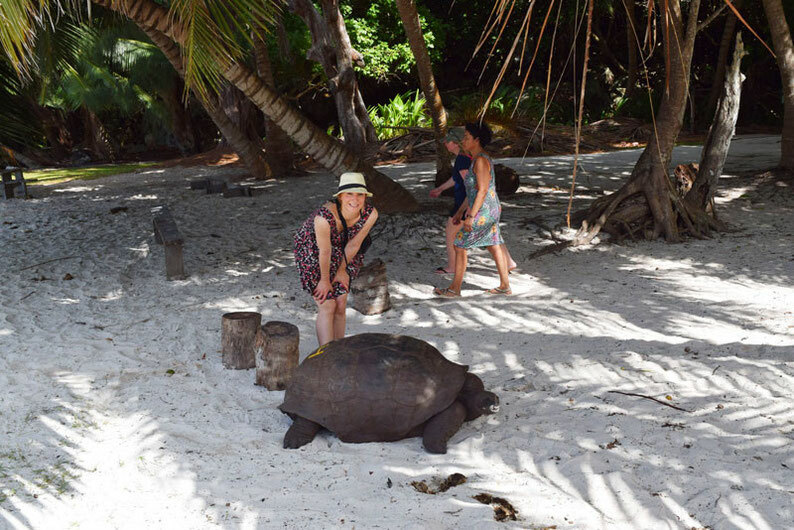 We will remember the Seychelles as islands with very friendly people, lots of activities to do, best beaches on earth, a diverse vegetation and colourful buildings.